The most expensive bottle of whisky was just sold in an auction in Edinburgh, Scotland. The 60-year-old bottle of Macallan Valerio Adami fetched a world-record price of $1.1 million at a Bonhams' whisky sale Wednesday. The whisky was distilled in 1926 and bottled in 1986. The bottle was designed by artist Valerio Adami as an extremely limited edition. The buyer is a U.K.-based whisky connoisseur who was in a taxi in Italy when the hammer came down, the Telegraph reports. 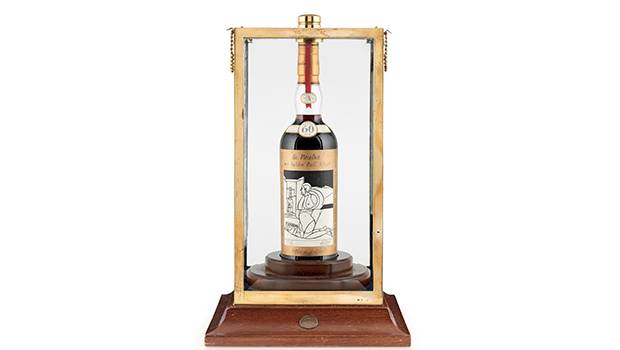 This particular whisky bottle which sold for $1,101,729 is significant because of its blend of rarity, vintage look and artwork, experts say. "The Macallan 1926 60-year-old has been described as the Holy Grail of whisky," Bonhams whisky specialist Martin Green said in a release. "Its exceptional rarity and quality puts it in a league of its own, and the world's most serious whisky collectors will wait patiently for many years for a bottle to come onto the market." "All the appeal of Scotch whisky — the myth, the tradition and the romance — find its ultimate expression in this bottle," said renowned international whisky consultant Charles MacLean. The bottle is one of only a dozen with its design in the world. It isn't known how many are still intact, but at least two of the 12 have been lost –– one to an earthquake in Japan in 2011 and another to consumption, according to Bonhams. Last May, another bottle of Macallan was sold by an auction house in Hong Kong for $1,057,442.37, the previous record for a bottle of Scotch.